Now one might wonder why, as a rule, Chinatown Chinese food is inferior to suburban food. Initially, we need to categorize Chinatowns into two groups. First are the historic core city Chinatowns, founded in the 19th and early 20th century, located in or near the downtown area of a major city. These would include still existing Chinatowns in places like Manhattan, San Francisco, Los Angeles, Honolulu, Brooklyn, Oakland, Chicago, Boston, Philadelphia, Washington D.C., Seattle, Portland, and in Canada, Vancouver and Toronto. The term also refers to now extinct Chinatowns like in Phoenix, Pittsburgh, Denver, Sacramento, San Diego, Fresno, Baltimore, St. Louis, San Jose, Detroit, Cleveland, and many other smaller cities in the West. Then there are the more modern, non-tourist “Chinatowns” that developed in the late 20th century, which might not be much more than a commercial area that started out as a Chinese shopping center and surrounding businesses, such as in Richardson (Dallas), Texas, North Miami Beach, Chamblee (Atlanta), Georgia or Las Vegas, or on the other hand, may be a full-fledged Chinese community, such as Flushing, New York. Having made this distinction, we may now categorically say that if a metropolitan area has a historic core Chinatown, and in addition has a major suburban Chinese community, you’re better off not going to Chinatown in search of memorable Chinese cuisine. But why is this the case? In large part it goes back to the fact discussed in my previous Menuism piece on Americanized Chinese food: that the first century of Chinese immigration to America was almost exclusively from the rural Toishan area of China outside of Canton. 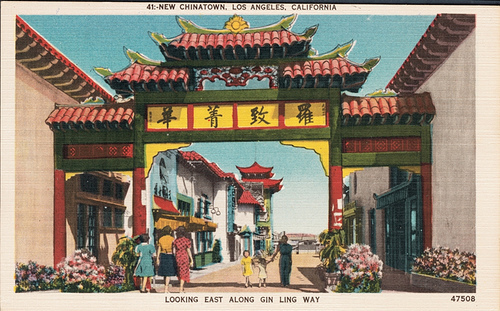 Consequently, every historic American core city Chinatown was founded by Toishanese migrants and initially featured the Cantonese-style food of this rural immigrant group. As the prior article noted, the food that the Toishanese brought to America was not the best food to begin with. Then, as the 20th century wore on, historic core Chinatowns became tourist attractions, necessitating the alteration of Chinese food served in Chinatown to suit tourist tastes. Indeed, many Chinatown restaurants totally catered to non-Chinese patrons, and such restaurants exist to this day. So if you go to Los Angeles Chinatown today, you will find that of the dozens of Chinese restaurants, there are only a handful that are not Cantonese, none of which would be classified as “authentic.” Likewise, in San Francisco Chinatown with well over a hundred Chinese restaurants, a similar survey also yields mostly Cantonese restaurants, though there is one authentic Shanghai-style restaurant and a couple of authentic Sichuan style eateries in that Chinatown. New York’s Chinatown is more diverse due to different recent immigration patterns, but the Cantonese influence remains heavy and the general caution about Chinatown dining applies here, too. But not every core Chinatown city has an equivalent Chinese community outside the central core. Consequently, in cities like Chicago, Philadelphia, and to a lesser extent, Boston, Chinatown may still be the place to go for that Chinese meal you have been looking for. And in cities which never had (or lost) an historic core, tourist-attracting Chinatown, such as Las Vegas, Denver, Houston, Austin, Dallas and Miami, the areas which are now sometimes referred to as “Chinatown” would indeed be a good bet. But otherwise, think twice about where you want to go for that great Chinese meal.